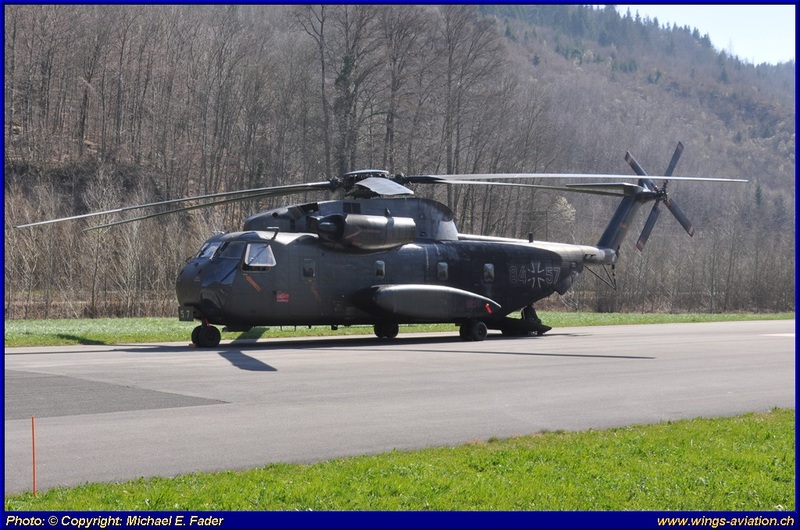 In our series of reports from the most important Swiss Air Bases we would like to report today from Alpnach. The airfield Alpnach is the main logistical base of the helicopter-force of the Swiss Air Force. From Alpnach the Operations center "air transport" coordinating the tasks of the the helicopter fleet. In use are the helicopter types Aérospatiale AS332M1 Super Puma, Eurocopter AS532UL Cougar and Eurocopter EC635. Alpnach with a population of 5'900 inhabitans lies in the canton Obwalden on the shores of lake lucerne. The main attraction of the village is the world's steepest cogwheel railway to Mount Pilatus, the local mountain of the community. The helicopter base can look back on a long history. The first landing strip was built in 1929 and during the early stages of the WW II, the first wooden hangar was build. In September 1942, the first fighters were based here and in 1943 the first concrete runway with a length of 875 meters was build. During the Cold War, started construction work on the famous Swiss cavern in 1952. One of six underground hangar complex in Switzerland are in Alpnach, which includes the normal elements of a military airbase - fuel storage, weapon storage, rooms for maintaining the aircraft systems, a communications centre, briefing rooms, kitchen, dining rooms, sleeping areas and generators for electrical power. 1960 the first operations with the De Havilland DH-112 Venom were made in the now finished cavern. In 1973 the Fighter-Squadron 19 was equipped with the Hawker Hunter and the conversion of the cavern was made. From 1979, the Fighter-Squadron 19 flew Northrop F-5E Tiger II until flight operations with Jets where given up in 2003. On January 20, 1964, the helicopter base of the army was opened in Alpnach. The helicopters that time were the Sudest Alouette II and Aloutette III. 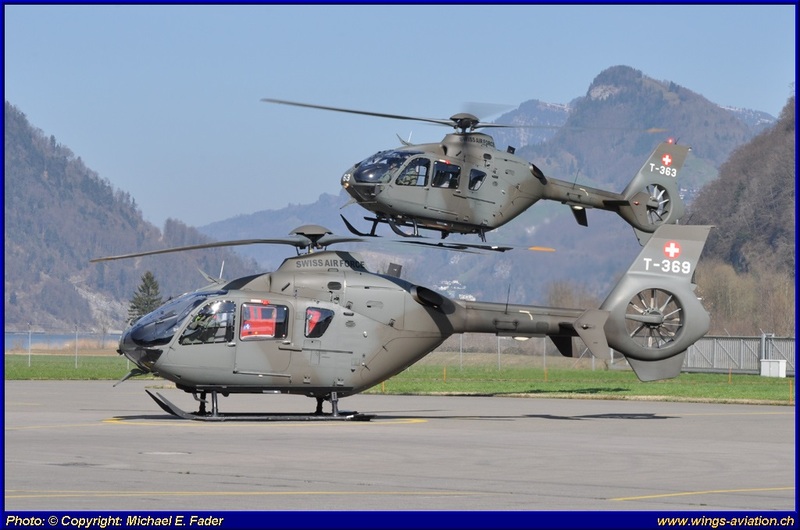 Alpnach is today the training base of the Swiss Air Force for all helicopter pilots. The air transport squadrons 6 and 8 are based here. The whole day the EC635 where used for flight training. Every Student had to make a flight which contains first to fly or hover some meters above the ground and fly squares and circles arround markings on the ground. Their skills for precise flying where sharpened this way. Later where some practice landings on the far side of the Air Base done, and after a longer training flights outside of the Air Base perimeter the training fight ended on the tarmac. The traning lasted some 45 minutes, after that a change of the trainee was done. The Helicopters in use at our day were T-363, T-365, T-366 and T-369. Later the day T-352, one of only two EC 635 VIP, was used for a taxi-flight for a Pilot to a other Air Base. One of the Cougar (#T-322) was the whole day "holzen", which means that the Helicopter was flying cut trees from the Hill behind the Air Base down into the Valley. A rather booring job for the Helicopter-crew, flying timeless up and down the Hill. The Cougar was once "hot refueled", which means - refueled with running engine. Some other Pumas where on normal flight duty throughout the day and where not so often landing as the EC-635's. 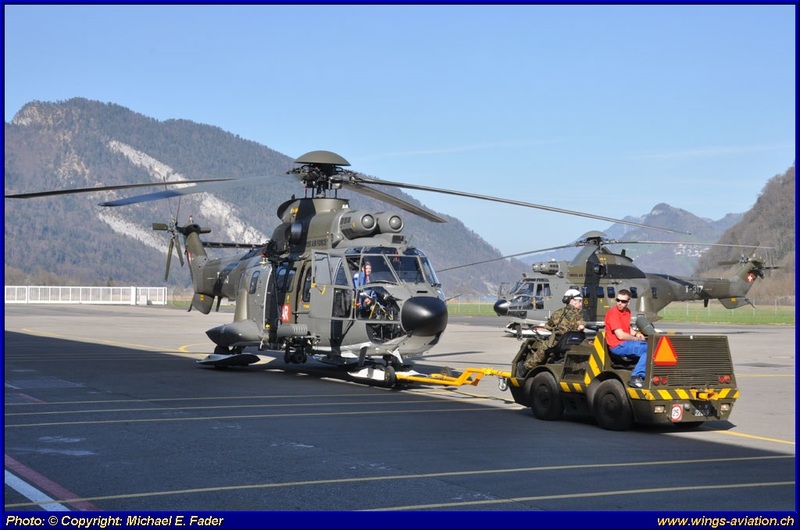 The Swiss Air Force uses the Super Puma and the Cougar who where very similar in apperance but a different kind of bread for all kind of duties. The whole Fleet of Cougar and Super Pumas are also equipped different. For instance the #T-315 was a SAR bird with FLIR and a strong Searchlight. There where some other vistors at the Base, during our visit. A German Luftwaffe Sikorsky CH-53D Stallion, who conducted some flying in alpine conditions in the mountains arround the Lake Lucerne. Second, a Finnish Super Puma on its delivery flight. The Finns where doing only engine runs the whole day and where not flying. all activities are shot-down for the day. All Helicopters must be moved in the Hangar. Normally a tow tractor (Mowag) is used, but Alpnach hat a new device. A remote controled Helicopter-mover. The device is so narrow and flat that it can pass under the Helicopter and lift it on. Carrying the Helicopter the device, which Alpnach has only two of them, move it into the Hanger. It's slow but more easily to handle, rather as the common way, which needs first to put some wheels on the skids of the Helicopter.